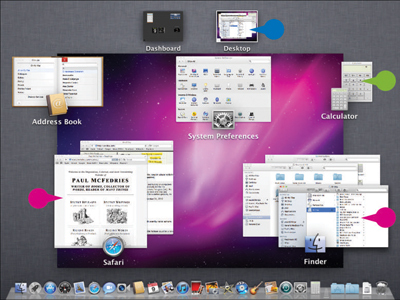 The Mission Control feature, which is new in Mac OS X Lion, makes it easier for you to navigate and locate your running applications. 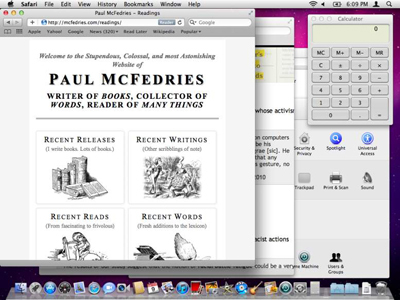 Mac OS X allows you to open multiple applications at once, and the only real limit to the number of open applications you can have is the amount of memory contained in your Mac. In practical terms, this means you can easily open a half a dozen or more applications, some of which may have multiple open windows. To help locate and navigate to the window you need, use the Mission Control feature. Place three fingers on your Mac’s trackpad and then swipe up. You can also invoke Mission Control by pressing F9 or, depending on how your keyboard is configured, Fn+F9. Mission Control displays each open window. Mission Control groups windows from the same application. To switch to a particular window, click it.